Brought to the West in 1965 by His Divine Grace A. C. Bhaktivedanta Swami Prabhupada, "Hare Krsna" quickly became a household word. In 1979, Dr. A. L. Basham, the world's leading authority on Indian history and religion, wrote of the Hare Krsna movement, "It arose out of nothing in less than 20 years and has become known all over the West. This, I feel, is a sign of the times and an important fact in the history of the Western world." But what exactly do the words "Hare Krsna" mean? 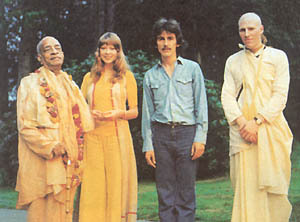 In this short essay from the LP Krishna Consciousness, which first introduced Beatles Ceorge Harrison and John Lennon to the chanting, Srila Prabhupada explains the meaning of the Hare Krsna mantra. The transcendental vibration established by the chanting of Hare Krsna, Hare Krsna, Krsna Krsna, Hare Hare/ Hare Rama, Hare Rama, Rama Rama, Hare Hare [Huh-ray; Krish-na; Rahm-uh] is the sublime method for reviving our transcendental consciousness. As living spiritual souls, we are all originally Krsna conscious entities, but due to our association with matter from time immemorial, our consciousness is now adulterated by the material atmosphere. The material atmosphere, in which we are now living, is called maya, or illusion. Maya means "that which is not." And what is this illusion? The illusion is that we are all trying to be lords of material nature, while actually we are under the grip of her stringent laws. When a servant artificially tries to imitate the all-powerful master, he is said to be in illusion. We are trying to exploit the resources of material nature, but actually we are becoming more and more entangled in her complexities. Therefore, although we are engaged in a hard struggle to conquer nature, we are ever more dependent on her. This illusory struggle against material nature can be stopped at once by revival of our eternal Krsna consciousness. Hare Krsna, Hare Krsna, Krsna Krsna, Hare Hare is the transcendental process for reviving this original, pure consciousness. By chanting this transcendental vibration, we can cleanse away all misgivings within our hearts. The basic principle of all such misgivings is the false consciousness that I am the lord of all I survey. Krsna consciousness is not an artificial imposition on the mind. This consciousness is the original, natural energy of the living entity. When we hear this transcendental vibration, this consciousness is revived. This simplest method of meditation is recommended for this age. By practical experience also, one can perceive that by chanting this maha-mantra, or the Great Chanting for Deliverance, one can at once feel a transcendental ecstasy coming through from the spiritual stratum. In the material concept of life we are busy in the matter of sense gratification, as if we were in the lower, animal stage. A little elevated from this status of sense gratification, one is engaged in mental speculation for the purpose of getting out of the material clutches. A little elevated from this speculative status, when one is intelligent enough, one tries to find out the supreme cause of all causes-within and without. And when one is factually on the plane of spiritual understanding, surpassing the stages of sense, mind, and intelligence, he is then on the transcendental plane. This chanting of the Hare Krsna mantra is enacted from the spiritual platform, and thus this sound vibration surpasses all lower strata of consciousness-namely sensual, mental, and intellectual. There is no need, therefore, to understand the language of the mantra, nor is there any need for mental speculation nor any intellectual adjustment for chanting this maha-mantra. It is automatic, coming from the spiritual platform, and as such, anyone can take part in the chanting without any previous qualification. In a more advanced stage, of course, one is not expected to commit offenses on the grounds of spiritual understanding. But there is no doubt that chanting takes one immediately to the spiritual platform, and one shows the first symptom of this in the urge to dance along with the chanting of the mantra. We have seen this practically. Even a child can take part in the chanting and dancing. Of course, for one who is too entangled in material life, it takes a little more time, but even such a materially engrossed man is raised to the spiritual platform very quickly. When the mantra is chanted by a pure devotee of the Lord in love, it has the greatest efficacy on hearers, and as such this chanting should be heard from the lips of a pure devotee of the Lord, so that immediate effects can be achieved. The material energy, called maya, is also one of the multi-energies of the Lord. And we, the living entities, are the marginal energy of the Lord. The living entities are described as superior to material energy. When the superior energy is in contact with the inferior energy, an incompatible situation arises; but when the superior marginal energy is in contact with the superior energy, Hara, it is established in its happy, normal condition. These three words, namely Hare, Krsna, and Rama, are the transcendental seeds of the maha-mantra. The chanting is a spiritual call for the Lord and His energy to give protection to the conditioned soul. This chanting is exactly like the genuine cry of a child for its mother. Mother Hara helps the devotee achieve the Supreme Father's grace, and the Lord reveals Himself to the devotee who chants this mantra sincerely.